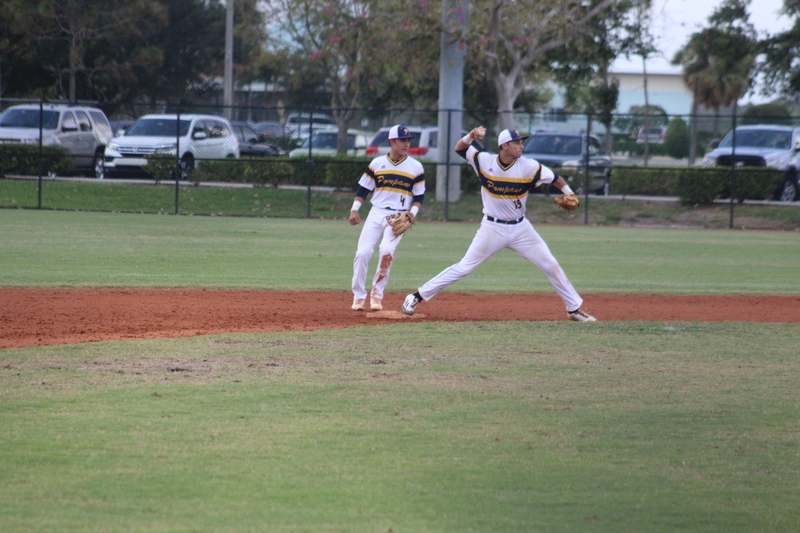 Senior shortstop Chase Costello throws the ball to first base as senior second baseman Trevor Kniskern hustles to the base to strike out the Pembroke Pines runner on April 23. Both Costello and Kniskern are being scouted by agents from teams like the Mets and Royals for the Major League Baseball draft, starting on June 4. Senior starting pitchers Chase Costello and Trevor Kniskern are being scouted by Major League Baseball teams and may be drafted in June. Both Costello and Kniskern have already signed at Division I universities, Louisiana State and Pepperdine respectively, but may turn down those offers to play professionally. Kniskern and Costello are not required to play for the MLB if drafted until they sign with a team, but both have received interest from several teams. Costello is being looked at by several teams, including the New York Mets. The drafting process is long, and both have been juggling playing for the school team, a travel team, school work and meeting with scouts. Despite the stress, both have received support from their team, friends and coaches.